George Méliès was born in 1861, in Paris, France. His father was a wealthy shoe manufacturer. Young Georges was interested in sketching, and he liked to make sets for and perform his own marionette shows. His parents did not encourage these fanciful pastimes, and Méliès eventually found himself working in the family business. However, he was allowed to take some art classes in exchange for his sensible cooperation. Eventually, Méliès’ obsession with the theater overcame him. He saw as many shows as he could. The young man was inspired by the skill of the great Houdini and other stage illusionists. When his father retired in 1888, Méliès sold his share of the business and bought the Théatre Robert-Houdin. He devoted himself to the running of the theater and would sometimes perform himself. Before long though, he would find a new obsession. 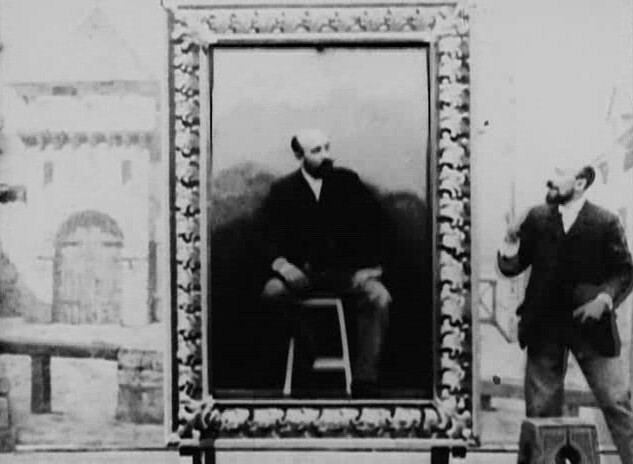 At a presentation by the Lumiere brothers in 1895, Méliès got his first glimpse of the movies. The world would have been a very different place if a magician had not discovered the movies in their infancy. As it was, Méliès was delighted by this fascinating tool, and was determined to conduct his own experiments with the new medium. He felt there was more to moving images than the straight documentation of the Lumiere siblings. 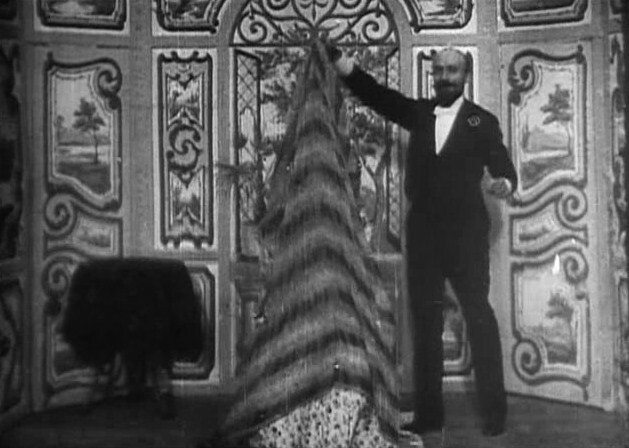 After failing to convince the brothers to sell him a camera, Méliès made his own machine. 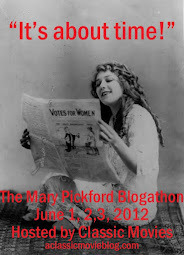 By May 1896, he was ready for production. 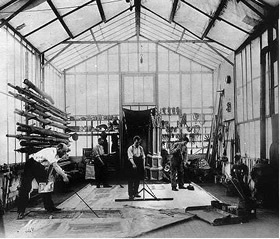 After filming in his garden for a time, Méliès eventually set up a spacious film studio with glass walls and ceilings on his property. Eventually another glass building would be built on the property to help meet audience demand for his movies. Méliès began making films at a brisk pace, most of them about three to nine minutes long. He was at the center of production, as he wrote, designed, filmed and acted in nearly all of his films. Judging from giddy energy of his screen performances, he enjoyed wearing many hats. 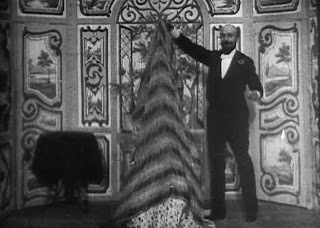 The filmmaker often used his movies as a medium for sharing magic tricks. This is why it is fortunate that he happened upon his most important special effect by accident. While filming a street scene one day, the camera stopped briefly. When Méliès looked at the film later, he noticed that at the moment of the break, the bus he had been filming suddenly disappeared and new vehicles replaced it. Making items appear and disappear by stopping and starting the camera would become one of his most commonly used film tricks. How lucky that he had the vision to make magic out of what would appear to many to be simply a technical problem. In 1902, only six years after starting work with the medium of film, Méliès produced its first masterpiece. A Trip to the Moon is believed to have been inspired by several works at the time that speculated about life on the moon. H.G. Wells and Jules Verne wrote about space travel, and Offenbach composed an opera about a trip to the moon. The public was ready to see the first science fiction movie. It took Méliès three months to film the 30 scenes that make up A Trip to the Moon. That qualified it for epic status in those days. The film was a huge success in France, and Méliès hoped to make a fortune in the United States as well. Unfortunately, other filmmakers, such as Thomas Edison, made their own copies of the film and began making money on his hard work. By the time Méliès set up a film office in the US to ward off the forgers, it was too late to recover from the damage already done. He also saw widespread imitation of his films, which ranged from homage to plagiarism. For the next several years, the film industry changed rapidly. Film producers embraced fast production in the interest of serving a public that was hungry for new movies. Méliès couldn’t keep up with the pace. He was an artist, and in attempting to film more quickly, the quality of his work suffered. The style of filmmaking was also changing. Audiences wanted real stories in realistic settings. They had lost their interest in the fanciful fiction Méliès favored. In essence, the industry grew up and he was unable, and perhaps unwilling to leave his fantasyland. Finally, in 1913, after 16 years of making movies, poor finances forced to Méliès to close his studio. At age 52, he turned his back on filmmaking so thoroughly that he went so far as to burn all of his props and costumes. To raise money, he sold his film stock, which was melted down to be made into boot heels. By 1915, he was forced to sell his beloved theater as well, a devastating loss that became more heartbreaking when the building was demolished for construction of a road after World War I. In order to make a living, Méliès sold toys from a stand his wife (who had once performed for his camera) owned in the Montparnasse train station. He was reported to have been miserable being confined in the store every day, which can be seen in a self-portrait he drew of himself sitting on a stool at the counter, his neck chained to the wall. He endured seven years of confinement in the store. 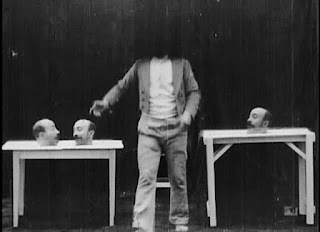 Méliès found a way out of his miserable situation in 1926, when Leon Druhot, who was editor of a publication called Ciné-Journal, discovered him working at the stand. Indignant that his hero would be reduced to being a shopkeeper, Druhot called for support from the public. This was the foundation of renewed appreciation for the filmmaker. In 1929, several of Méliès films were rediscovered and restored. They were presented to a delighted audience in an evening that raised the old filmmaker’s spirits. He passed the rest of his days with his family in a rent-free apartment, provided by his grateful countrymen. By the time Méliès died in 1938, he was admired as an important pioneer in filmmaking. Even today, over one hundred years after his prime, Méliès’ films continue to charm audiences. Their surreal beauty, lively spirit and the charm of his magic tricks have timeless appeal. 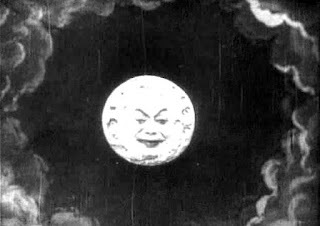 Come back tomorrow for day two of my Méliès tribute, when I will review a new documentary about the restoration of a hand-tinted color version of a Trip to the Moon (1902). KC, a wonderful tribute to George Méliès, the filmmaker and the man. I hope he would have been pleased that he is remembered and his films enjoyed a century later. I look forward to reading part two of your tribute. I wonder, do you have a favorite Méliès film? Thanks whistlinggypsy. I think he would have been happy, and perhaps astounded, that people still admired him a century later. He would have known that everything he did had lasting meaning. I don't have a favorite Méliès film. There's no way I could pick one!